Even apart from most quality security solutions that smoking is a new but not so far seen, virus can pull and do its evil purpose. Therefore, the ideal would be that there is a solution that enables virtual PC, but that is far easier and more convenient to use. Do you think such a thing does not exist, be mistaken. Sandboxie is just such a specialized program that allows you to launch programs on your computer in a specially created an isolated zone. Not even a little new thing, but long known to security technology, which most often is used for testing applications that simply ca n not believe how the act and not, of course, when tested to risk damage to your computer. Sandboxie on the look works quite simply. 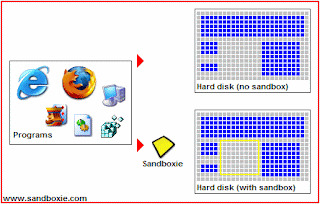 Each time you run a program or script to pass data between the hard disk and applications you're running does not, indeed, end up on the disk, but will be diverted to the virtual zone that Sandboxie is created and within which an application is running. This virtual zone actually contains copies of key system files and directories, and Windows registry base. Time is, of course, ensured that any intentionally evil or good whatever application tries to modify - and, in fact, make the virtual zone, not the original files . Sandboxie is free for personal use and you can feel free to use, but all the while not using more than one virtual zone.